A brief spell of rainfall in Indonesia has minimized the number of fire hot spots that have been spewing toxic smoke across the country ... for now. Here are four ways we can #StopTheHaze once and for all. 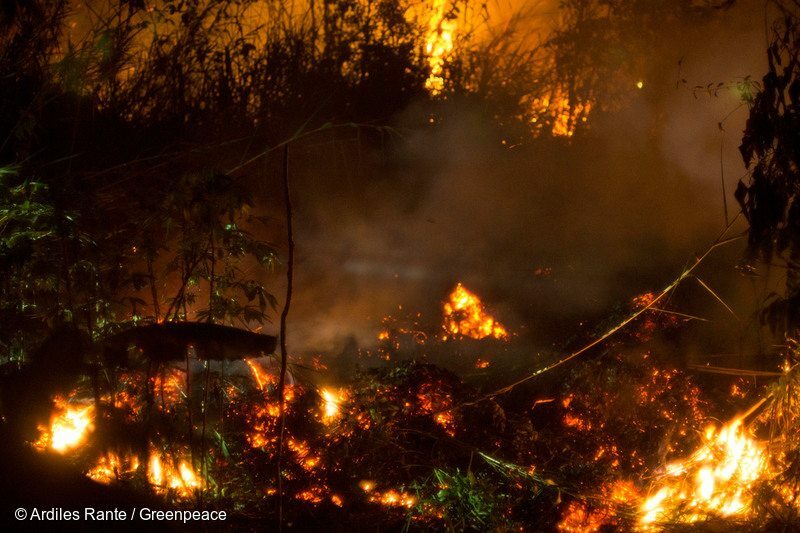 Fires rage in peatland on the island of Borneo, Indonesia. When peatlands are cleared and drained for plantations, the massive amounts of carbon they store are released into the atmosphere, creating a climate crisis. This article was originally published by Greenpeace International. Since August, forests have been set alight to make way for plantations — a practice that has been happening for decades. But this year’s El Niño means that conditions are extra dry, leaving toxic smoke to lay and linger. To make matters worse, about half of these fires are taking place on peatlands, which are a major global carbon storehouse. In recent days, the rate of carbon emissions from Indonesia’s fires has outpaced the entire U.S. economy. Brief rainfall this week in Sumatra and Kalimantan has provided modest relief, but the crisis is far from over. The fires and smoke will return so long as companies are destroying forests and draining peatlands and the government is lax on enforcing its policies. Here’s how we can stop this devastating disaster once and for all. Military help extinguish the fire of burning peatland inside the Orangutan conservation area in Kapuas district, Central Kalimantan province, Borneo island, Indonesia. Fact: stopping forest destruction is one of the easiest and most cost effective ways to prevent catastrophic climate change. 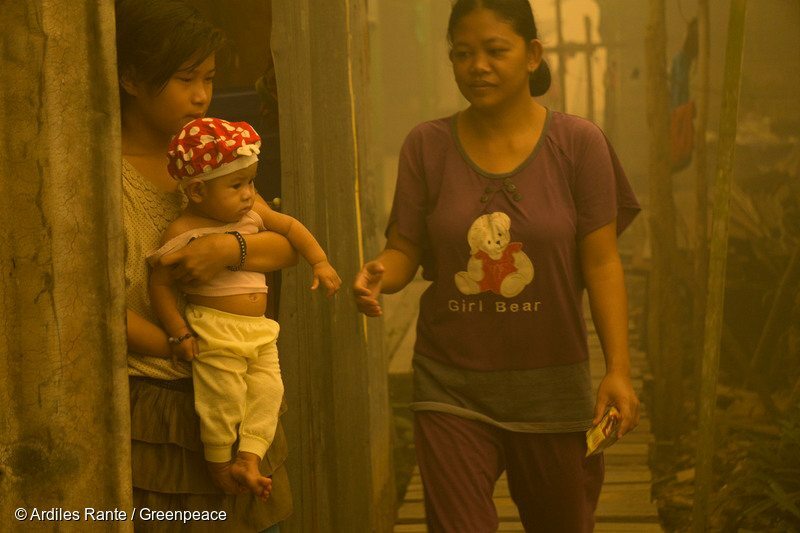 It’s estimated that this year’s haze will cost Indonesia’s economy $14 billion. All agricultural commodity suppliers must immediately stop forest clearance and any further development on peatland; they must be monitored and held accountable for any potentially dangerous and illegal activities. 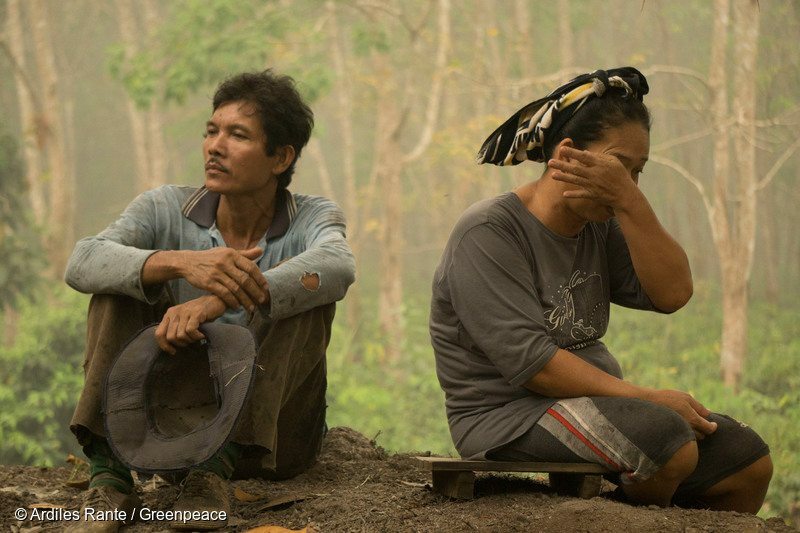 Ernie (45) with her husband Pak Plus (47) guard their rubber tree plantation all day to make sure it won’t catch fire. Last year, President Joko Widodo vowed to protect peatlands and showed his solidarity by damming a canal to stop the drainage of a peat forest in Sumatra. Since then, the area has hardly been affected by this season’s fires. Last week he repeated the same vow, calling for a moratorium on licensing for peatland concessions after at least ten people died due to respiratory illnesses caused by the smoke. It’s time for the president to honor his promise. Re-flooding and implementing other water management measures in critical peatland areas can sharply reduce fire risks — a solution Greenpeace has proposed for years. 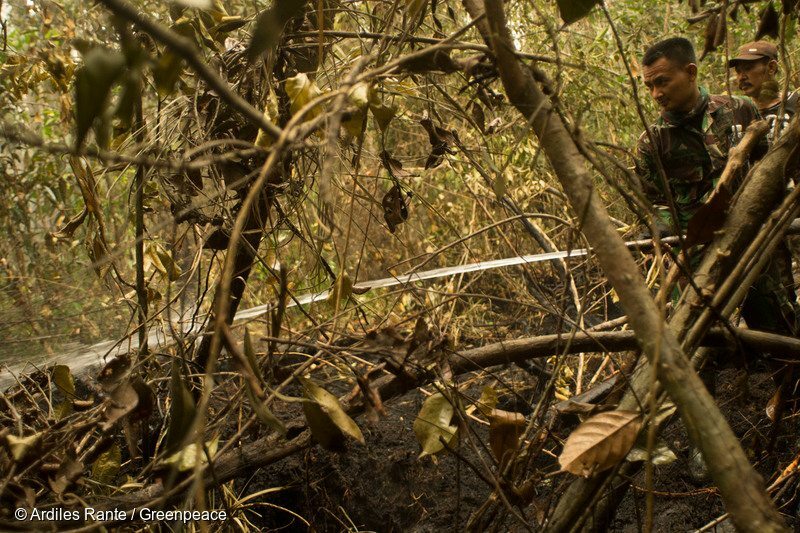 Firefighters extinguish fire in burning peatland inside an Orangutan conservation area in Borneo. 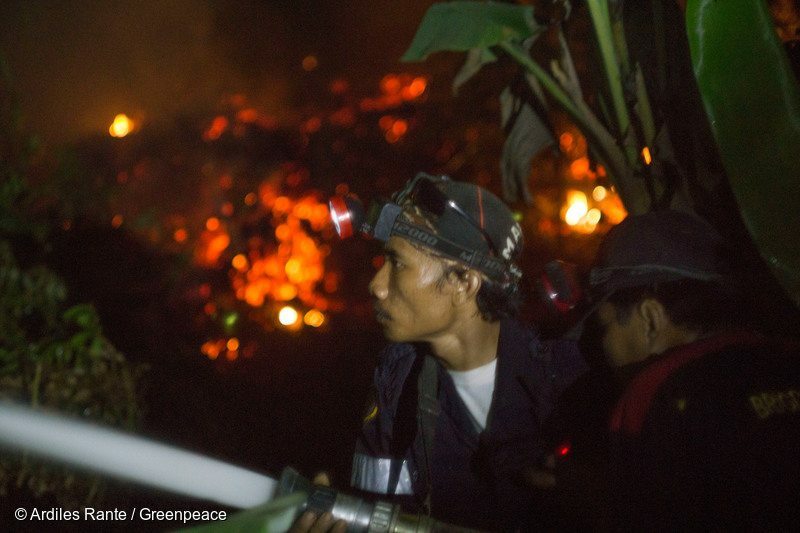 Greenpeace researchers looked at 112,000 fire hotspots recorded from August 1 to October 26, 2015, which showed that nearly 40 percent of fires had occurred inside mapped concessions: land granted by the Indonesian government to companies for logging or plantation development. There are many, many concession where fire hotspots are indicated in mapping analysis, but our research also indicates that the company associated with the most is Asia Pulp & Paper. This is not surprising. First, they are the largest concession holder in Indonesia and have a legacy of deforestation. Second, they are the only company that has released accurate maps showing where their own, as well as their suppliers concessions are. However, the government has recently refused Greenpeace’s request to make public the latest concession maps for analysis. Other companies have released very little information about their land holdings and the concessions that supply them, which makes us wonder — what do they have to hide? Ema (13) holds her brother Ading (7 months old) who suffers from respiratory tract infections. Smoke from landscape fires kills an estimated 110,000 people every year across Southeast Asia, mostly as a result of heart and lung problems. The only way to stop these fires is to stop deforestation. 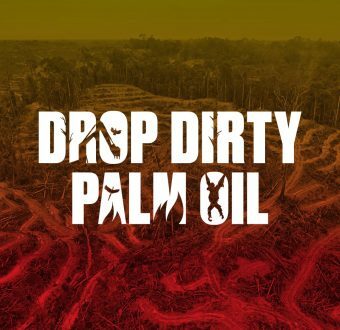 Greenpeace is calling for palm oil and paper companies to join forces and enforce a total ban on forest clearance and peatland development in Indonesia. Companies could make this happen. After all, if corporations have the ability to destroy the world’s forests, they also have the power to help save them. Want to help #StoptheHaze once and for all? Take action today.